William Safire, columnist for The New York Times, died yesterday at the age of 79. Safire was famous for much: his conservative voice on the otherwise heavily liberal op-ed page, his On Language series on grammar and vocabulary, and his involvement (Safire would say orchestration, as per an editorial penned in 2009) in the famous "Kitchen Debates" between former Soviet leader Nikita Khrushchev and then-Vice President Richard Nixon. Late July, 1959, Safire was in Moscow as a press agent covering the American National Exhibit, a display of modern American cultural artifacts including fashion shows, art galleries, and industrial achievements. He is associated with the debates largely due to a photograph (above) he took which was widely circulated, but also due to the instrumental role he supposedly took: when a government official seemed at a loss as to where the world leaders should head next, Safire yelled above the crowd, "This way to the typical American house!" leading them towards an exhibit displaying modern electric appliances and changing the path of the Cold War. The Kitchen Debates were not exactly intended to take place. 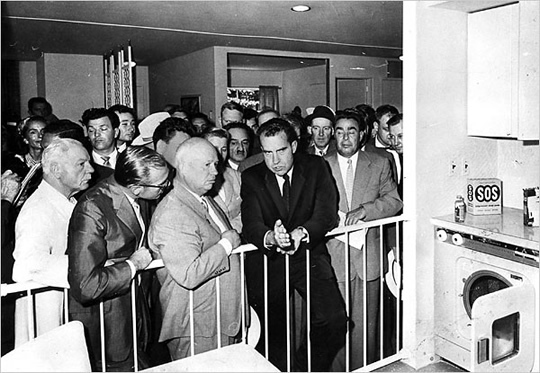 Instead, they grew out of a tour through a model home at the American National Exhibit in Moscow on July 24, 1959. 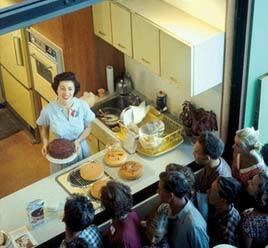 The house was equipped with modern technology designed to make the American housewife's life easier, but Khrushchev thought it ridiculous excess, saying "We do not have the capitalist attitude toward women" and "Don't you have a machine that puts food into the mouth and pushes it down?" This lead to a spirited debate on the relative merits of capitalism and communism, with each leader focusing on the industrial, not the martial, achievements of his respective country. That is, they discussed dishwashers instead of rockets, with Nixon arguing for innovation and Khrushchev arguing for durability. The model house itself was filled with such achievements, and was supposedly affordable for the average American family. Ordered by Jack Masey working for the US Information Agency, a foreign affairs agency which orchestrated cultural exchange exhibits, and built by All-State Properties, a development group from Florida and Safire's employer, the house included many luxuries of modern American life: dishwashers, washing machines, electric stove tops, modern refrigerators, frozen dinners, and Pepsi-Cola. (There was no garbage disposal, as Safire found out when he tried to sneak a reporter friend into the press area under the premise that he was a "garbage disposal unit demonstrator.") These items were all the rage in America, and understandably caused a sensation amongst the mid-century Russians. The model home was a hit at home, as well: the house exhibit was the beginning of a movement referred to as "Leisurama." Leisurama homes included all of the luxuries of modern life displayed in the Russia exhibit, and came completely equipped with everything its new owners could ask for, from beds to chair to silverware. In the dawn of the era of supermarket convenience, Americans lusted after one stop shopping, and Leisurama homes were available for purchase on the 9th floor of Macy's and cost between $13,000 and $18,000. A community of them were built in Montauk, New York, and still exist to this day, although many have been remodeled. Currently, a Leisurama home goes for about $500,000.